To solve the problem of playing ASF videos on different video players, mediAvatar ASF Converter is unveiled to convert ASF videos to AVI, MOV, MP4, MPEG1, MPEG2, MPEG4/H.264, WMV video or MP3, M4A audio. On the other hand, you could convert many other video formats to ASF format, including AVI, DV, DIF, MKV, MPG, MPEG, MPA, DAT, VOB, MP4, 3GP, 3G2, MOV, QT, RM, RMVB, DAT, WMV. All these ASF conversion is processed at high speed, and can be accelerated if you have multi-core CPU and NVIDIA CUDA or AMD APP GPU. 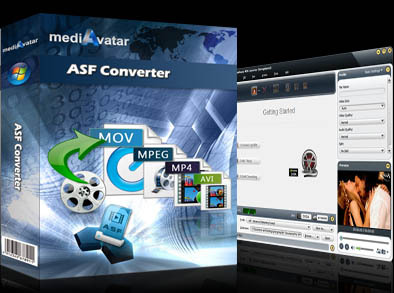 All ASF video conversions can be handled in a few clicks, and mediAvatar ASF Converter gives you much more than that, e.g. you can extract any video segment, customize the output file size, split large video files, or adjust lots of parameters before converting. It has never been easier to convert ASF videos with this mediAvatar ASF Converter! Convert ASF videos to popular video and audio formats (AVI, MOV, MP4, MPEG1, MPEG2, MPEG4/H.264, WMV, MP3, M4A), e.g. 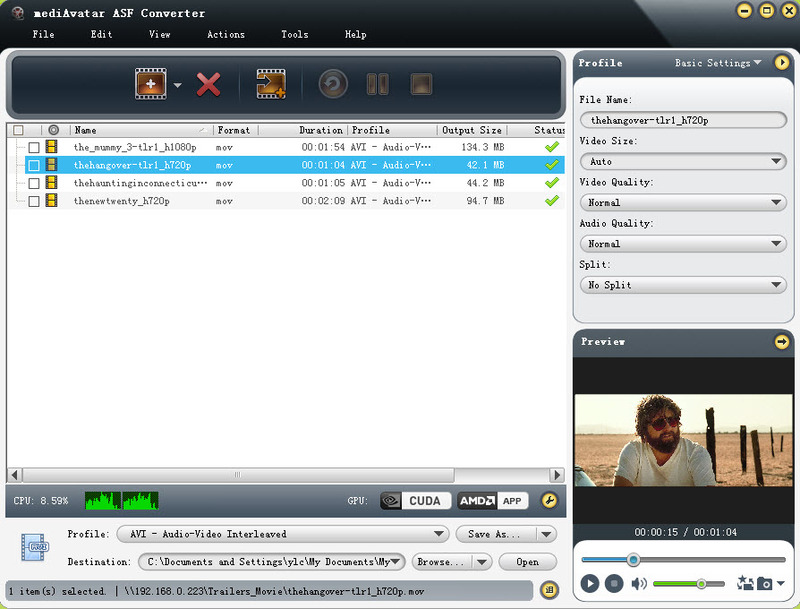 convert ASF to AVI, ASF to WMV, ASF to MP4, ASF to MPEG, ASF to MPG, ASF to MP3. Not only convert ASF to videos, but also convert other videos (AVI, DV, DIF, MKV, MPG, MPEG, MPA, DAT, VOB, MP4, 3GP, 3G2, MOV, QT, RM, RMVB, DAT, WMV) to ASF format: convert WMV to ASF, MP4 to ASF, FLV to ASF, MPEG to ASF, MPG to ASF. Convert to/from ASF videos at super high speed, and speed up the ASF video conversion by up to 5X with the support for multicore-CPU processing and NVIDIA CUDA & AMD APP GPU acceleration technology. By presetting a split time or duration, mediAvatar ASF Converter would automatically split and convert video into video segments. With many adjustable parameters (bit rate, frame rate, codec, resolution, quality, audio channel, etc. ), professional users can make any adjustments to satisfy different requirements. Download a demo of mediAvatar ASF Converter and check more! Unsatisfied with the output file size but too troublesome? The Bitrate Calculator tool in this ASF converter makes it easy to handle by computing the video bit rate according to the file size you enter. Set a start time & duration to get a segment from original video file, then this ASF converter would automatically convert this segment to ASF or other video formats. By setting different output formats to the same file, you would get them converted simultaneously. Play videos before ASF conversion to check whether you're converting the right video or video clip; and snap any video image you like during preview. Making this ASF converter work in background could save CPU resource for other running applications. Preset this ASF video converter to auto exit, or hibernate, shut down, standby your computer after converting without waiting for the conversion to the end. Play movies with high quality audio and video in any format on your DS with mediAvatar DPG Video Converter.